SWAT 4 Games is a 3D action game that puts players in command of a special team of police on duty to resolve the tension in dangerous situations and responsibilities as an officer of the elite. In Game SWAT 4 is a very authentic weapons used are designed include non-lethal options such as a tear gas and flashbang grenades. The final goal of the police team was not to injure or kill the suspects but to catch them before they can cause harm. 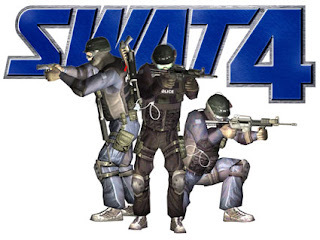 SWAT series has reached the fourth series, something which indicates that the game is not just a series that arise and pass you in the world of PC gaming. SWAT is an FPS Serial serial berjeniskan close quarters combat, based on realistic actions of the police special forces in the United States. As the name implies SWAT really try to show mock the actions undertaken by its members, ranging from criminals to raid the place of handling the bank robbery and hostage situation. After you run this game, you will be faced with several choices of career, training, instant action, play quick missions, quick mission maker, host games, join games, as well as setting and credits. For starters we should choose to practice in advance, especially for those who have never played the SWAT series, the training provided including the brilliant, is sufficient to play this game without having to memorize, looking for the manual or look back on how to play.